↑ Prince-Hughes, Dawn (1987). Songs of the Gorilla Nation. Harmony. p. 66. ISBN 1-4000-5058-8. 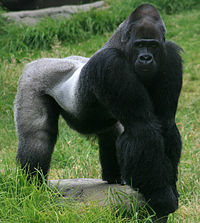 ↑ "Santa Barbara Zoo – Western Lowland Gorilla". santabarbarazoo.org. Retrieved 2006-10-10. ↑ Palmer, Jane. "How does a gorilla get a physical? Carefully". Retrieved 03/08/2007.